An Alternative to HeadCrumbs & TwitchCrumbs Combined. This only adds in a new mob with player skins. This doesn't add in the mob heads from HeadCrumbs. But the player mobs will drop player heads. 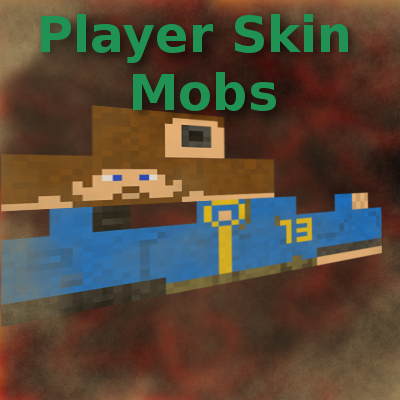 It is a simple mod that allows you to add in mobs with player skins. Nothing Fancy about these mobs. They just attack you. No Special AI. You can add new skins via the skins.json. You can use Twitch apps Whitelisting. Most of the code was reused from my Raiders mod. Raiders will be getting a major over haul soon as well. So be on the look out for that. Is there an alternative source link to use for Twitch whitelisting? whitelist.twitchapps.com has sadly shut down. no clue this is news to me. Yeah, this happened quite recently due to a change in Twitch's code apparently. Thank you for your prompt reply, if I find any alternatives that might work I will send them your way. Otherwise, if you find one, please let me know. Can you possibly make an option to disable death messages in game? For a mob farm this can be pretty bad. If running a server and wanting this in conjunction with CCI is this a server side only mod or would players have to download it as well? You need both on client and server for it to work. Could you make it an option to disable the naming system included in this mod? you have to be more specific? I don't know what you mean by the naming system. The displayable names above their heads. I would assume they're name tags but I wouldn't exactly know. actually its suppose to be an option, just isn't in 1.11+ versions yet. I still don't get what this mod has to do with Headcrumbs. Does it add mob heads? Twichcrumbs is an add-on to Headcrumbs, adding in twitch subscriber white-list to add more mobs. This mod does both, and since currently 1.12 doesn't have support yet (I know the maintainer). If your talking about the mob heads for vanilla mobs and some modded mobs. No I probably wont be doing that. I can add more Description, change my wording up a bit. But Next update the current player skins will be dropping player heads.